Datu Kalun, Pedro Javier Cuevas "Founding Father of Lamitan"
Born in Bacoor, Cavite Province on May 6, 1845 to Sebastian Cuevas and Gregoria Javier. Pedro was a hard-working, pious, and patriotic young boy. At the age of 27, he was sentenced to death along with his two friends for their anti-Spanish activities which took place during the Cavite Uprising of 1872. They were charged for the death of a Spanish officer of the Guardia Civil. His punishment was commuted to life imprisonment for his non-direct involvement in the murder. He was exiled to San Ramon Penal Farm in Zamboanga, a place for political prisoners. The harsh treatment he received from the Spanish jail guards in San Ramon Penal Farm led him and six other inmates to stage a successful revolt and then escaped towards the mountains of Ayala, a nearby barangay. They crossed the Basilan Strait with a stolen vinta and landed in Malamawi Island, Basilan, only to find out that they had to face three hostile forces: The Spanish authorities, Yakans, and Sulu forces. The group led by Pedro had no choice but to fight in order to survive. His strong leadership, and his skills in diplomacy and combat earned him the respect of the natives and his fellow escapees. Spanish Colonial authority's efforts to capture him were unsuccessful. Joined by Yakan fighters and military mutineers, Pedro's group grew in numbers and they became an effective fighting force against the Spanish authority as well as Sulu slave-traders and pirates who frequented Basilan to collect tributes. Over the years, his group gradually conquered 26 villages – almost the entire Basilan Island, but he wittingly spared the Spanish military garrison in Isabela, which he and his followers saved from the Sulu pirates in the late 1870's. In 1880, Fr. Pedro Llausas, a Spanish Jesuit priest in Isabela facilitated the request for the amnesty of Pedro and nineteen of his fellow escapees and mutineers. He was pardoned by the Spanish Crown on July 21, 1882, during the term of Fernando Primo de Rivera, Governor General of the Philippine Islands. 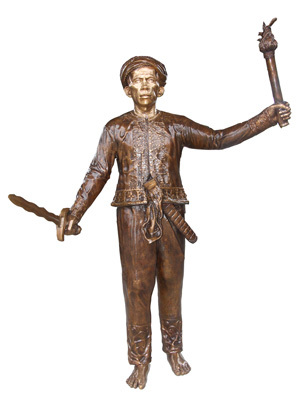 During a duel in the early 1880's, Pedro Cuevas defeated Datu Calun, a leading Sulu warrior, who was sent to challenge him. Sometime in 1884-1885, the title Datu was vested on him by Ali Ud-din. He then assumed the name of Calun. Since then, Pedro Javier Cuevas came to be known in Philippine history as Datu Kalun, the undisputed ruler of Basilan and nearby islands. In 1894, he led a successful expedition to Bohe Lebbeng, a coastal village in the eastern part of Basilan against the forces of Sulu General, Datu Djulkanayin, who came all the way from Jolo in May of 1894, with his armed followers to collect tributes and assert control over the people of Basilan. The peaceful settlement of this incident showed his brilliant skills in diplomacy and strategy, thereby, affirming his position as Teniente Absoluto of Basilan. Datu Kalun's strenuous physical life from his teenage days drained him of vigour. He passed away in Lamitan, Basilan on July 16, 1904 at the age of 59. Among his significant achievements in Basilan were the imposition of justice system, introduction of efficient farming method, economic and social development, consolidation of the Basileños, and freedom from Sulu pirates, slave traders and Spanish incursions. These made him a great leader of his time. Datu Kalun was a patriot to his countrymen, a hero to his followers, and an icon to his family.